Lack of awareness and financial backwardness often forces students, especially girls, to drop out of school. After the fall of CPM rule in West Bengal, the political power went into the hands of Trinamool Congress. The chief of this political party is Mamata Banerjee. She implemented several schemes for development of education for all in the state. One such scheme that aims at offering financial assistance to female students is Kanyashree Prakalpa. Applicants will receive scholarships to continue their education at school as well as college levels. Development of education – Financial assistance will go a long way to encourage female students as well their parents to strive towards higher education. With the implementation of this project, thousands of poor female students will be able to pursue education without financial worries. Three scholarship components – The state government started this scheme with two different benefit components. The first offered grant in annual basis, while the second offered one-time grant only. Now the state is all set to implement a third competent to fuel higher education. Financial assistance for girls – On an annual basis, the state government will transfer Rs. 500 in the bank account of all female school students. Apart from this, students will also stand a chance to receive Rs. 25,000 as a one-time grant from the state government. Reduce female school dropouts – As state will offer financial assistance to these students, the parents need not worry about providing for educational expenses. It will directly help to bring down the overall school dropout percentage in the state. Eliminate child marriage – Only unmarried students will be able to receive this money, till the age of 18 years. It is a clever ploy to discourage parents from getting their girls married at a young age. Government school students – The scheme details highlight that only students from state-run school will be able to apply for this financial assistance. Rural and urban implementation – The scheme has been implemented both in rural and urban areas. It will help in increasing female students in the entire state at the same time. 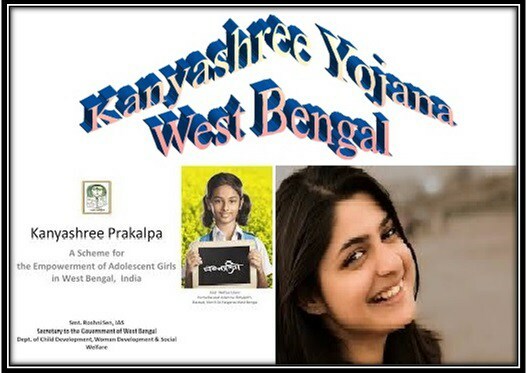 Age criterion – If any girl is interested in registering for Kanyashree Prakalpa K1 category, she needs to fall within the age bracket of 13 and 17 years. Students of 8h to 12th standard – This scheme will offer annual education grant to those applicants who are studying in any class between 8th and 12th standard. Residential criterion – Only those candidates will be able to attain the perks of K1 category are legal residents of West Bengal. Marital status – All applicants, who desire to attain K1 category approval, must not be married. Income range – If the total family income of the applicant is more than Rs. 120000, then she will not be able to attain the annual grant under K1 category. Age criterion – The age of beneficiaries, interested in attaining K2 category perks, must be between the age of 18 and 19 years. Marital status – Only those girls will be able to apply, who are not married. Academic institute – The candidate must be admitted in a regular school, college or skill development institute to get this financial assistance. It is also mandatory for the candidate to attend regular classes. Income criterion – The parents of all applicants, who desire to attain the scholarship under K2 category, must not have an annual earning that exceeds the Rs. 120000 on a yearly basis. Residential proof – Due to the residential requirement, all candidates need to submit their residential certificates. Age proof – Due to the age related criterion, applicants will have to attach a copy of their age certificates. Statement of being unmarried – Only unmarried applicants will be able to get the financial benefits of this scheme. Thus, candidates need to submit a statement during initial registration, and during annual renewals that they are not married. Income proof – As the scheme is especially targeted towards candidates who come from weak financial backgrounds; all applicants need to attach their family income certificates. Academic certificates – All applicants who desire to attain scholarship under K1 category, will have to attach their school certificates. Bank passbook details – As all monetary transactions will be made via the bank account, applicants must attach the photocopy of bank passbook page. The state government will need bank name, address, branch name, IFSC code etc. Disability certificate – In case the applicant has any physical or mental disability, then she will have to attach disability certificates with the registration form. Interested applicants will be able to receive the Kanyashree Prakalpa registration form from the principal’s office. For ease of rural candidates, the state government has kept an offline application process. Once the interested applicants have collected the registration form from the respective school, she needs to go through it carefully. She needs to fill in the form with her personal and residential details. She also needs to mention the name and address of her current school. The student must get this form signed by her parents. Once she has signed it herself, the registration document must be submitted in the school office. This form must be attached with all necessary documents. It is the responsibility of the school to submit these forms at the respective state government department. The head of education department will verify these dorms and crosscheck the details. If everything is in place, he/she will put a stamp of approval on the document. During the submission of each form, an acknowledgement slip will be handed over. The student can get information regarding the application by logging in with this acknowledgement slip number. After several verifications, the state education department will upload applicants’ facts on Kanyashree Prakalpa official website. The link of this website is wbkanyashree.gov.in. All applicants who have already submitted the application will be able to check the current status of this form. One can check this status by logging on to the official website of the scheme. For this, candidates need to click on the link https://wbkanyashree.gov.in/kp_4.0/index.php. One the candidate lands on the homepage, she will get the “Track Application” option just above the banner advertisement of this scheme. The applicant has to click on this link. It will trigger the site to bring up another page. The candidate then needs to click on the dropdown arrow alongside “Year” and “Type of Scheme” options. Then the candidate needs to type in the unique application ID. Next, she has to mention her date of birth. This will trigger the site to check the government database. Once a suitable match is found, it will display the current application status. How to Apply for Scheme Renewal? Renewal is necessary for girls who are interested in receiving annual education grant from West Bengal government. But these beneficiaries will not have to fill and submit any renewal forms to continue receiving the money. The head teacher or principal of the school will do this task on behalf of the girls. Each year, the applicants will have to submit a notification that will state that they are still under the age of 18 years, and are still not married. If any girl does not fulfill wither of the two conditions will be barred from receiving this educational grant. Both grants will be transferred to the active bank account of the beneficiary. If the applicant does not have an account, then she needs to open one in any scheduled bank. It will be the responsibility of the bank employees to help Kanyashree Prakalpa beneficiaries in opening an account. Bank transfer will ensure that the right person gets the money. The state chief minister has announced a third category under the Kanyashree Prakalpa. This branch will offer grant to those female students, who are pursuing higher education in colleges or universities. It is popularly known as Kanyashree K3. All applicants, who are studying in the science stream, will receive a monthly scholarship of Rs. 2500. The candidates who are pursuing higher education in any arts subject will receive Rs. 2000 each month. This money will help in meeting necessary educational expenses. K2 applicants – If the candidate is not registered under the Kanyashree K2 project, she will not be able to attain this higher-education grant. There will be no new applications for K3 scheme. Academic requirement – After passing 12th standard, these beneficiaries will have to take admission in any college. In case the candidate does not wish to continue higher education, she will not receive this grant. So, it is mandatory for all applicants to submit college admission papers. Marks related requirement – Only those female candidates will be able to apply for K3 category who have been successful in securing 45% marks in the final examination of 12th standard. A photocopy of the 12th standard mark sheet must be furnished for scrutiny. Age related criterion – To encourage female students of all ages, there is no upper age limit to attain this financial grant. Any girls who have crossed the age of 18, would be given technical training. Under the flagship Kanyashree Prakalpa Scheme, job openings have been created for women. The technical training would be given in association with Training & Skill Development.